Titillate your tastebuds and be enthralled by aesthetic treats as renowned pastry chef Janice Wong launches a brand new degustation menu at 2am:dessertbar. Humans have always been visual creatures, and perhaps that is why presentation is important when serving a dish. As both a pastry chef and artist, Janice Wong has mastered the craft of making food into an art form – her edible art showcases and beautiful desserts are proof of that. Now, with a newly launched degustation menu at 2am:dessertbar, prepare to please your eyes and your tastebuds, and enjoy the creativity and artistry of each dish. With sleek edges and dark accents, 2am:dessertbar has a modern, yet intimate aesthetic that would be perfect for after-work drinks or an evening sweet treat. Seat yourself along the bar, which features an open concept kitchen — you’ll be able to watch the chefs skilfully craft and plate your dishes and desserts! The newly-launched 5-set degustation menu (S$58) aims to showcase unique flavour combinations that change with the seasons. 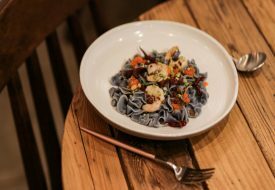 You can choose to pair your desserts with cocktails for an additional S$40, while a smaller 3-set degustation menu is also available at S$38 with a cocktail pairing option at an additional S$30. Encounter the brightness of spring in this menu with the likes of vegetables and delicately-balanced Japanese ingredients such as yuzu, kinkan and shungiku; thanks to Pastry Chef Tomo Nakashima drawing inspiration from her heritage for the various desserts. 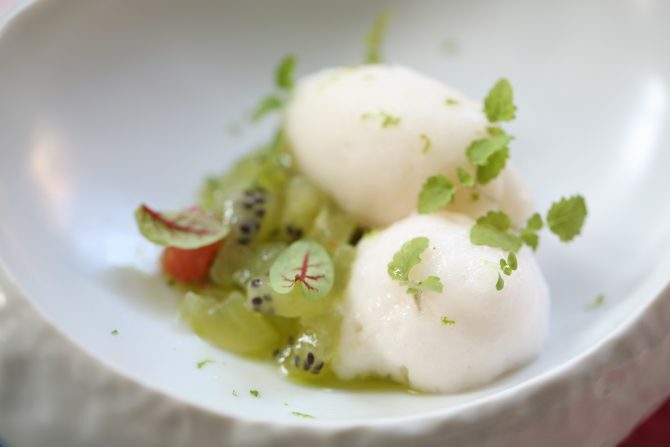 The menu starts off with the refreshingly bright Soursop Garden: soursop sorbet with herb-marinated fresh kiwi, fresh pink grape fruit, garden grapefruit foam, micros lemon balm, lime peel and – this is the fun part – a few spritzes of bergamot aroma spray. This aromatic dish made us think of sunshine and the best parts of a cup of iced soursop juice; like what a spring/summer dessert should taste like. Get your cameras ready to capture a shot or two of the pretty Raspberry Fromage! 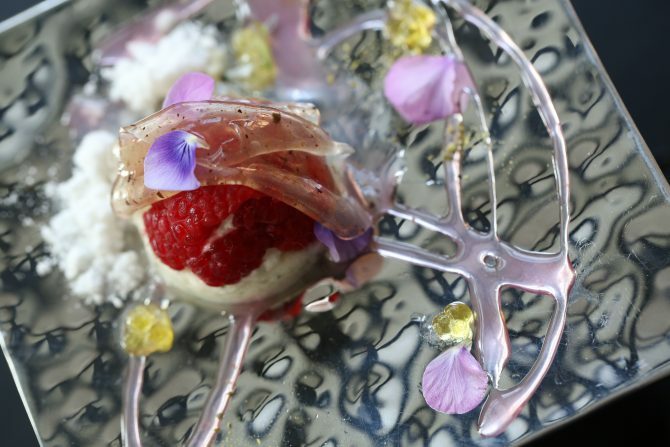 A kaffir lime leaf parfait is topped with fresh raspberries and a delicate juniper berry jelly sheet, drizzled with rose gel, and completed with sanshou pepper, Fromage Blanc cream and olive oil caviar. A seemingly complex dish, the various textures and flavours melded together into a delightful fruity floral scent that lingered on our tongues. We especially loved the Fromage Blanc cream that literally melted in our mouths! The Pandan Chocolate was also one of our favourites! 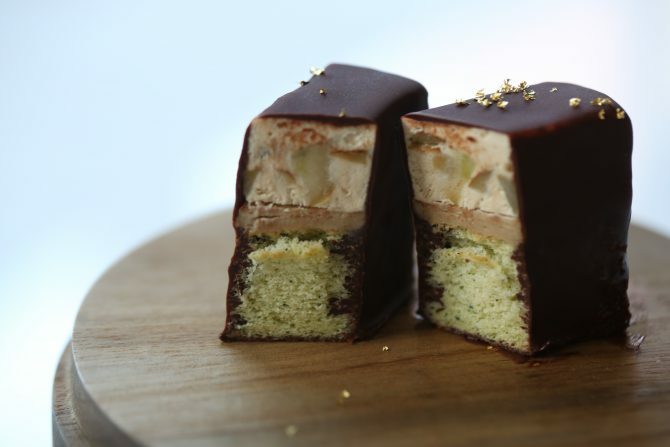 An unassuming block covered in dark chocolate and sprinkled with gold flakes, Chef Tomo sliced it into half to reveal the three layers of pandan sponge cake, Japanese black sugar caramel parfait, and Orelys ganache. Frozen with liquid nitrogen before being dipped in the dark chocolate coating, this reminded us a bit of our childhood love for ice-cream cakes, coupled with the locally-inspired pandan sponge, we were hit with a sense of nostalgia. We especially liked the Orelys ganache – made from blond chocolate containing fragrant dark muscovado sugar, it had surprise bits of fresh green grapes inside that provided a delightful contrast to the other layers. The Japanese-inspired Kinkan Osmanthus Tea gets two thumbs up from us too! Kinkan compote, pistachio crumble and osmanthus tea gel are paired with smoked cream, olive oil-marinaded pomelo and sprinklings of yuzu powder, but what we loved the most was the shungiku ice-cream. 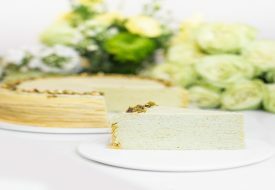 A leafy Japanese vegetable similar to the Chinese dang-o, its vibrant green colour is all natural in the ice-cream – and has a wonderfully heady, tea-like taste that completed the mild sweetness of the osmanthus and the citrusy sweetness of the kinkan very well. Fans of spices would like the Lemon Ginger: torched meringue, lemon cream, fresh lemon sorbet, ginger spice confit, spice-infused jelly cubes, a ginger ribbon tuile, toasted tiger nuts and a milk chocolate financier. With the aroma of gingerbread and the taste of spiced citrus punch, this was a wonderful end to the degustation menu. The tiger nuts add an amazing texture to the dish, and are actually tubers, not nuts, so don’t shy away from this dish if you’re allergic to nuts! With desserts that are both a feast for your eyes and stomach, 2am:dessertbar is the place to go if you would like to experience food as not just the act of eating, but an appreciation of it as an art form.